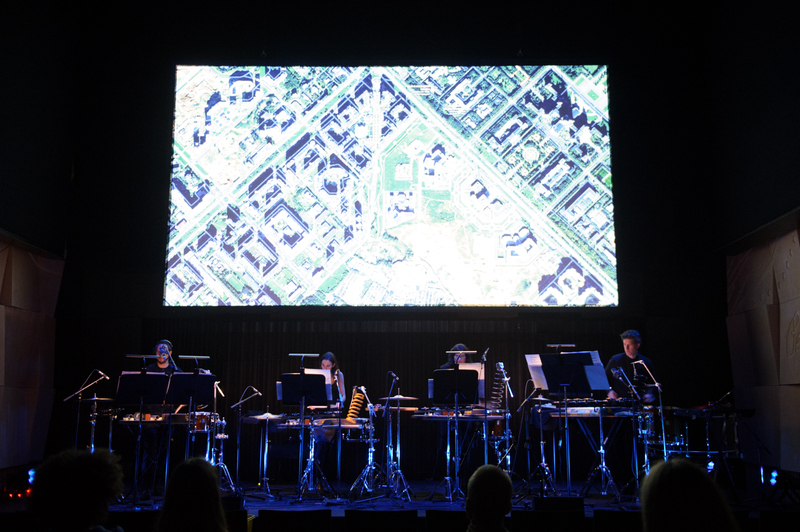 As tiny festivals of sonic exploration, interdisciplinarity, and improvisation, the Liquid Architecture and Inland concert series are natural partners. For one of the year’s first concerts they teamed up to bring the world’s foremost experimental cellist Okkyung Lee, to Melbourne. The concert’s title suited the lead-up to Trump’s inauguration. “Nothing but disaster follows from applause” is a quotation from the Austrian author Thomas Bernhard, who consistently criticised nationalism and religious hypocrisy in post-war Austria. While there is some uncertainty as to whether populism will develop into fascism under Trump, the election of a climate change denier to the White House all but seals the fate of our natural environment. Far from relaxing or soul-cleansing, the ecological theme that ran through “Nothing but disaster” was a “dark ecology” tinged with the melancholy knowledge of our contribution to the destruction of our own ecosystem. Alexander Garsden and Ida Duelund-Hansen are better known to Partial Durations readers as a post-spectralist composer and a Scandinavian avant-garde chanteuse. These musical personalities find a magical synthesis in the folk-revival duo True Strength. Switching between Danish and English, Duelund-Hansen’s light and pure voice sings of waves, tussocks of grass, and terraced hillsides over Garsden’s floating acoustic guitar harmonies. Duelund-Hansen’s double bass part journeys along in melodic counterpoint. The overall sound is reminiscent of Alela Diane and Ryan Francesconi’s album Cold Moon, albeit denser and with a greater rate of textural change. True Strength’s songs are series of reflective tableaux, but they never let you linger too long. You can and should hear True Strength on Spotify (though don’t mistake them with the christian metal band), or live in Hobart and Melbourne over the next week. Having last heard Oren Ambarchi perform a richly-textured noise set through a hulking battery of amplifiers at the Aurora Festival in 2011, I brought my earplugs to the Abbotsford Convent. These turned out to be completely unnecessary, as Crys Cole and Ambarchi’s principal source of amplification were networked smartphones. Cole used an iPad to send nocturnal field recordings to the phones spaced around the hall. Croaking frogs and chirping insects wafted through the room while Ambarchi repeated a single note on an acoustic guitar. Throughout the set, Cole’s sound design shifted into man-made analogues, including what sounded like rustling paper and vocal whispers. I found this set no less affecting than a full-body immersion in noise. Who can innocently listen to the sounds of nature any more? Every environmental sound is now an indictment of our custodianship of it. Once the purview of dollar-bin relaxation tape manufacturers, recording a cicada is now a radical act. The synthesiser and tape collaborations of James Rushford and Joe Talia have long stretched the limits of the audible, but their whisper-soft set for “Nothing but disaster” gained a new poignancy from the ecological preludes of True Strength and Cole and Ambarchi. Among the Lynchesque synth drones I heard distant wolf-howls and crickets, all suffused in an electromagnetic, static glow. Okkyung Lee’s set heralded from the other side of the world and the opposite end of the dynamic range. Playing behind the audience and in complete darkness, Lee let us know what an efficient noise machine the cello is. Growling, grinding, and never still, Lee savaged her instrument in new and remarkably dexterous ways, though this was only evident to me when I craned my neck to catch the shadow of her bow arm. We’ve all heard a cello getting murdered, but it would have been good to see how Lee does it. For the most part her technique was lost on the audience. Liquid Architecture and Inland are the products of an adventurous and discerning experimental music community with the ability—more or less unique in the contemporary music community—to attract audiences from other art forms. Such curatorial vision has the power to develop powerful artistic responses to the social and environmental disasters of our age (take your pick). Alexander Garsden, Rohan Drape, and Jessica Aszodi perform Garsden’s Four suns and a whole sky on fire. Photo by Lloyd Honeybrook. The Inland concert series explores a musical interior. Like the blend of properties at the center of a colour graph, Inland explores the gradations between notated, improvised, and electroacoustic performances. Concert 15.3 at the Church of all Nations in Carlton explored a single, focussed point of this hinterland, that of static textures developed through layering live and captured sounds. Samuel Dunscombe’s Unfinished Piece for 27 Clarinets is performed by only three clarinettists, in this case Dunscombe, Aviva Endean, and Michiko Ogawa. The electronic part quickly swells to an atmosphere of drones and squawks. The effect is like listening to a great crowd of people, with half-heard conversations and choruses arising and subsiding from the dense body of sound. Rohan Drape is largely to blame for the perfectly balanced sound diffusion throughout the concert. In each piece, the electroacoustic part perfectly matched the live performers to the extent that, from my vantage point at the back of the church, they were difficult to distinguish. This was as true for instruments as it was for voices. The collaborative work Four suns and a whole sky on fire amplified and multiplied phonemes and words uttered by the soprano Jessica Aszodi before Drape and Garsden introduced a droning accompaniment. Jeanette Little’s Barbaric Yawp for Uilleann Pipes was a highlight of the night and not just because it featured an instrument so little-heard in the contemporary music world. 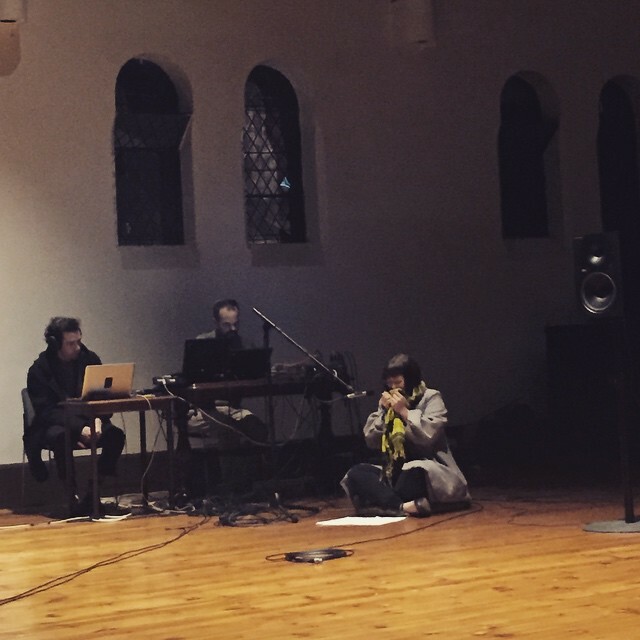 Once again, the focus was on the instrument’s polyphonic texture and Matthew Horsley carefully managed the piece’s microtonal pitch bends and shifting drones. The melody, when it arrives, is a bleating, squealing thing that resonated delightfully in the church with a little help from the sound design. Judith Hamann’s untitled solo cello performance featured a series of expertly-diffused extended cello sounds, my favourite of which was bowed cello spike. The vibrations of the spike were so slow that they formed a rhythm of sussurating sounds accompanied by maritime creaks. The stage faintly glowed beneath the cross of the Church of All Nations. The semicircle of speakers and microphones formed a sacred space, like prayer or a pulpit, within which the sounds of the performers were amplified. But no god was intended to hear these performances, nor does Inland espouse any particular cosmology. With the concert closely following the Supersense Festival of the Ecstatic and directly preceding the Ballarat Slow Music Festival, I wondered after the intentions of the audience members scattered around on the floor. Why do audiences so desperately want to doze? The society-wide will to relaxation is not just a symptom of our busy, technology-stuffed lifestyles, but of our increasing infantilisation as consumers who can’t be trusted to go to bed on time without the right app. I recently photographed this ridiculous Qantas ad in an airport. Needless to say, a world of entertainment is not much use while you are asleep, much less if you are trying to get to sleep on a full stomach. 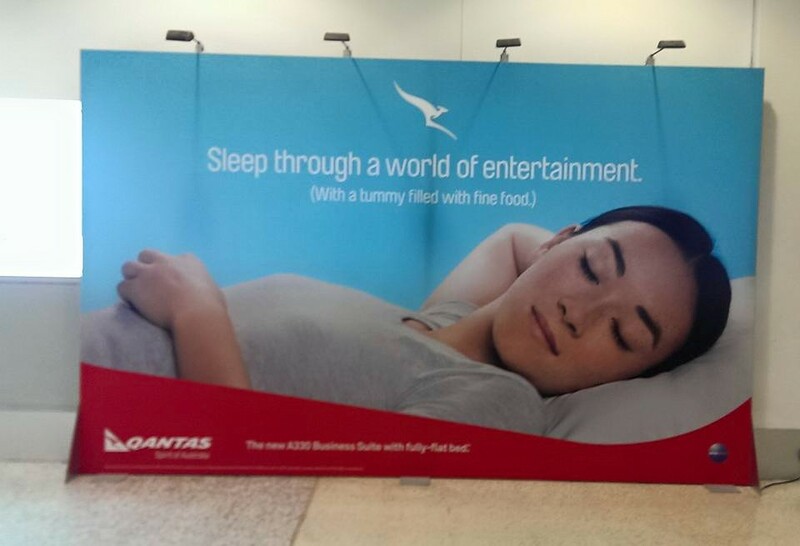 But Qantas wants you to consume even when you are full and asleep. There is nothing new in this. If the pinnacle of luxury is gorging oneself and falling asleep in front of a television, then a good portion of the population lives the dream on a regular basis. This ideal of luxury also informs contemporary music. Where falling asleep in a concert was once seen as a bad thing, the ambient sound artist Robert Rich has been presenting “sleep concerts” for several decades. In contemporary art music, it seems that every few months an audience is invited to lie on cushions or curl up in pods. Trance, transcendence, non-knowledge, or inner experience have their place and exploring these states of mind may be extremely beneficial to one’s health and well-being, but can’t this happen outside of the concert hall? Old-fashioned though these Enlightenment ideals may be, society extricated itself from the comfort of religious dogma for compelling reasons. Even though the last couple of hundred years of technological advancement may well lead to the doom of Western Civilisation as we know it, we can’t crawl back inside the womb now. I am interested to see what composers will do next, once they get bored of the ersatz-sacred bubble. I have written several times about David Toop‘s performance at the 2013 Totally Huge New Music Festival, where he brutally interrupted his soporific, crackling sound design with deafening strikes of a snare drum. While this is one of the most appropriate responses to a society falling asleep at the wheel, I must admit that I too lay down for Jessica Aszodi’s closing performance of Morton Feldman’s Three Voices, hoping to see the light. Unfortunately I missed Aszodi’s performance of Three Voices at the 2013 Bendigo International Festival of Exploratory Music, so I was excited to hear Aszodi’s performance this year. Once again, the projection of Aszodi’s two prerecorded parts was perfectly matched to her live voice, so that one was sometimes at a loss to tell which part she was singing. A short check of the tempo and Aszodi was away, gliding effortlessly through the hour-long performance as though on a cloud. Or perhaps that was the audience, which was utterly transfixed for the duration of a performance that requires such obvious skill and precision. Aszodi’s easy command of such an exposed work made it an otherworldly experience. Though I finally succumbed to lying on the floor and enjoying the mesmerising refraction of light through half-closed lids, I’m taking a twenty-minute nap before concerts from now on. By drawing their inspiration from urban life in the second half of the twentieth century, minimalist composers bear witness to the most carbon-intensive period in human history. The jumbo jet opening John Adams’ Nixon in China and his orchestral fanfare Short Ride in a Fast Machine, Steve Reich’s City Life and Glass’ epic modern chronicle Koyaanisqatsi all show us a world kept in motion by fossil fuels. The composers may not have intended to represent our carbon-dependent lifestyles. It is all the more interesting that the issues they thought they were addressing, including the mediatisation of politics, consumerism, the proliferation of nuclear weapons and the alienation of individuals from their communities, are all connected tangentially to this one core issue that now looms as the greatest threat to human life. The works bear witness to this moment in history more than judge it. Through its serene and spacious textures, the minimalist musical language often struggles to cast judgement. Instead it impartially reflects, if not sublimates, the images it is associated with. Julia Wolfe’s Fuel brings this problem running all of our trains, cars and planes to the surface. The piece is accompanied by time lapse footage of the port of Hamburg by Bill Morrison. Wolfe describes the piece as beginning in a conversation with Morrison: “We talked about the mystery and economy of how things run—the controversy and necessity of fuel—the global implications, the human need.” Originally composed for Ensemble Resonanz as something of a virtuosic party piece, the MSO strings kept up the stiff pace set by guest conductor André de Ridder. No lugubrious meditation on modern life, Fuel has the orchestra scrubbing, running and glissing for the better part of twenty minutes. Meanwhile, the film shows cranes loading containers on and off of enormous cargo ships. There is something daunting about the film and music, as though the whole frenzied business were precarious, excessive, in a word: unsustainable. Cellist Oliver Coates returned to the stage to perform Tan Dun’s cello concerto based on music from the soundtrack to the film Crouching Tiger, Hidden Dragon. From the opening glissando-strewn theme I was transported back to my spotty adolescence, seeing the film’s most excellent and unrealistic sword fights for the first time. As such, I loved the cheesy main theme that returns three or four times throughout the concerto. This time around I also appreciated the piece’s extensive catalogue of well-integrated extended techniques, including left-hand pizzicato rolls, glissando effects, plectrum use and en masse string-slapping from the orchestra. 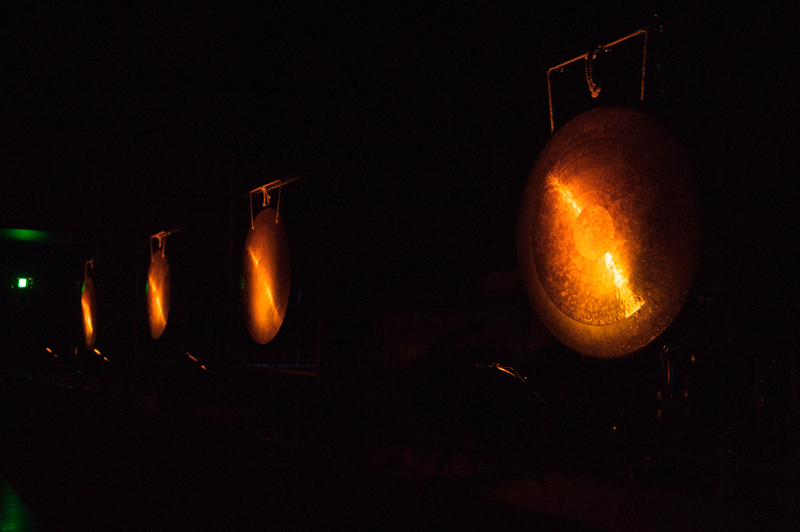 Alexander Garsden’s Faculties Intact is the second Cybec commission to be heard at this year’s festival. As Garsden related in his interview with De Ridder, MSO’s first play-through of the piece in January helped him understand “how overblown and ill-informed [his] initial ideas were.” One of the great virtues of the Cybec program at the Metropolis festival is that composers have the opportunity to refine their compositions and then hear them performed again. The audience is also able to hear the diversity of compositional styles among young composers, including Garsden’s idiosyncratic combination of spectralist, stochastic and other post-serial methods. Garsden’s style is unique in Australia. Many Australian composers fixate upon the performer or the instrument. The idea of a piece may have its genesis in the gestures that a performer makes while playing. They may also want to expand the range of sounds one can conjure from an instrument. Garsden seems more interested in the sound you hear rather than how it is made. He may work from a spectrogram (a graph of the energy at different frequencies of a particular sound) to derive the pitches he will use. He then makes sure that certain relationships hold between the timbres of different instruments. For instance, in Faculties Intact the violins move their bows too quickly, so that the sound produced is high-pitched and squeaky. As the violins move into higher and higher registers, the percussionist begins bowing a piece of styrofoam, carrying this squealing sound even higher. At another moment, the violins scrub away lightly in a lower register, producing a rustling sound that is adopted and expanded by a tam-tam scraped with the shaft of a mallet. Smooth, “ordinary” tones make an appearance as an afterthought at the end of the piece, just in case you forgot they were there. Instead of gas-guzzling technologies, The Light draws inspiration from Albert A. Michelson and Edward W. Morley’s experiments in physics. Michelson and Morley determined that there was no substrate, such as a “luminiferous aether,” through which light waves travelled. Their experiments led to research into the velocity of light and eventually the Special Theory of Relativity. Glass takes this pivotal moment in the history of modern science as the basis for his orchestral work The Light, writing that “this is a portrait not only of the two men for whom the experiments are named but also that historical moment heralding the beginning of the modern scientific period.” Where the concert began with Wolfe’s picture of the twentieth century running itself into ecological crisis, the concert ends with the dawn of the century and all of its scientific hopes. Can a new scientific dawn resolve the crisis brought about by the past century of industrial activity? This is a question that has been left to the next generation of minimalist composers, such as the artists of the Bedroom Community label. Julia Wolfe, Fuel; Tan Dun, Crouching Tiger Concerto; Alexander Garsden, Faculties Intact (con tutta forza); Philip Glass, The Light. Kim Tan and Lizzy Welsh’s new duo explores contemporary music on baroque instruments. Baroque violin and flute is a magical combination, with the brightness of the former complementing the mellow tones of the latter. 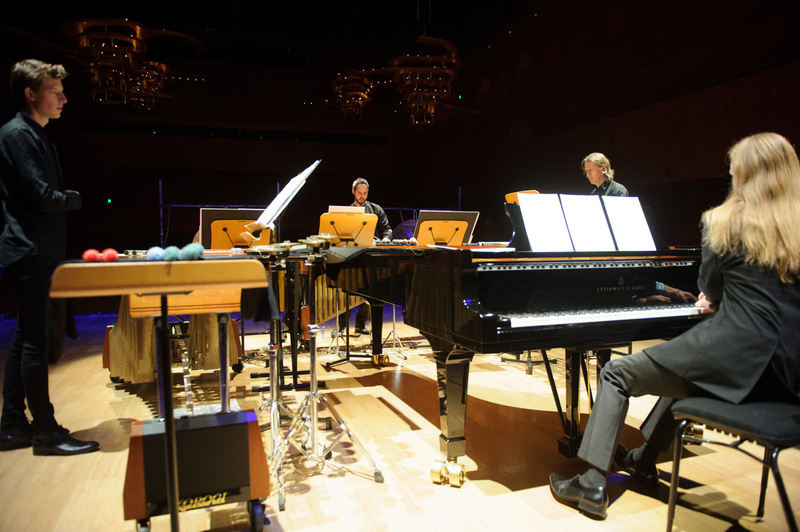 In their first concert, Tan and Welsh team up with virtuoso keyboardist Peter de Jager and composer Alexander Garsden for an exchange between diverse sound worlds. Peter de Jager’s Prelude explores baroque gesture in the semi-improvised form of a Prelude. The trio of harpsichord, violin and flute begin in a state of gestural unison, with De Jager playing dense trills in the middle of the keyboard. Within this sparkling, rumbling cloud of sound the violin natters away with snatches of diatonic melodic fragments, while the dark flute plays a warbling ostinato. The violin gestures become more protracted as the piece progresses, with arpeggios and repetitive string crossings. The harpsichord also becomes more individuated, with chords and recognisable ornaments. Occasionally the flute and violin take leave of the trio texture for an episode in imitation, riffing on murmurs and double-dotted passages. De Jager progresses around the harpsichord, taking a grand tour of its registers, manuals and stops. The violin and flute are given a similarly thorough working-through, with moments for sautillé bowing and playing from the fingerboard to the bridge. Tan’s control of the baroque flute provided a broad, warm sonority sadly absent from Australian contemporary music. Hopefully many commissions will follow. Two works by Clarence Barlow utilised modern instruments, but brought them into contact with drones and improvisations on limited rhythmic and modal resources inspired by Classical Indian music. In Until … Version 7, a guitarist plays a pattern of harmonics in an improvised rhythm and order, while an accompanying electronic drone rises imperceptibly in pitch. Garsden maintained a sense of line in each variation, keeping the audience rapt throughout the entire performance. In this way the audience were able to register the magical effect of the changing harmony of the accompanying drone, which gradually introduced complex harmonic beats to different parts of the guitar’s pattern. Until … Version 8 also uses variations on given sets of pitches and rhythms for a solo instrument, but this time for piccolo (played by Tan). The piccolo and electronic parts combine to produce difference tones in the listener, which at times take on striking melodic independence. Alexander Garsden’s Law II for baroque violin had its second outing at the Oscillations concert. The piece is at once an accomplished exploration of spectralist compositional techniques and a sinisterly theatrical work. Garsden builds a bewildering electronic track out of analogue synthesis and granulated baroque violin. The teeming soundscape of insect-like chirps projects a Heart of Darkness-like horror as the baroque violin enters doing what it does best: bow sound. The piece proceeds in a series of electroacoustic builds and instrumental responses, with the violin becoming more violent as the piece progresses, until the violin is positively attacked with the side of the bow. Oscillations presented two contrasting lines between baroque and contemporary music. One the one hand, sound, including timbre and temperament. This perspective resonates with our everyday rapport with baroque music. The early music industry today is in part a set of recording practices highlighting “instrument sound”. After two and a half centuries of equal temperament the range of temperaments used in the baroque is also an entirely appropriate point of fascination. On the other hand, notation, including form and gesture. De Jager’s Prelude was particularly representative of this second line. Many baroque pieces were not written for specific instruments and the refinement of notation and practice in continuo playing ushered in new forms and styles that were only secondarily cemented in a particular instrumental tone colour. This line seems more closely aligned with serial and then complexist composition. It will be interesting to see how these different lines are developed in Tan and Welsh’s future concerts.